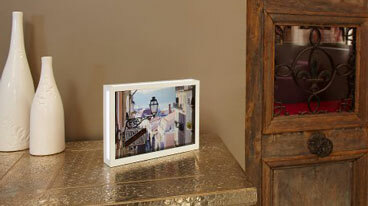 Most digital photo frames are, let's be honest here, kind of tacky and cumbersome to use. So I was excited to find the 10.4-inch wireless DIA Parrot by NoDesign, a beautiful frame on which anyone would be proud to display their digital snap shots. The DIA's most striking design choice is the open space between the backlight and the LCD itself. This creates a transparent effect similar to a lightbox or slide film. The appearance is gorgeous, and somewhat ethereal. There are even openings on the sides that let light spill out for added ambiance, or for objects to be inserted between the backlight and the LCD to create a silhouette. Loading images is a snap. The frame has built-in Wi-Fi for connecting to Flickr, Picasa and MobileMe out of the box, two USB ports for a external drive, built-in Bluetooth for sharing files from your phone and an SD card slot. But it's not just about pictures. The Android-based frame has a web browser (you can use the USB ports for a keyboard and mouse) and a few apps, including FrameChannel, which pulls in weather and news, Cabinet of Curiosities, which scrolls 19-century illustrations across the screen, and Holiday, which plots your images of a map. You'll pay for all function and style. The DIA Parrot by NoDesign will be available next month for $500.